Potentially the last ever feature film produced by Studio Ghibli, When Marnie Was There is a touching and unique animation that proves once again why the studio should keep on making movies. Based on the book by Joan G. Robinson, the story concerns young Ann Sasaki (Sara Takatsuki). She lives in Sapporo with her foster parents and is clearly unhappy. A shy girl who wants nothing to do with the other kids at school, she’s sent away to spend time with her foster mum’s relatives in a seaside town, hoping that the fresh air will also help her asthma. Whilst there she’s drawn to the mysterious mansion across the marsh, and the figure of a blonde girl (Kasumi Arimura) in the upper window. Focussing on female characters is one of the things that Ghibli does so well. The majority of the characters in When Marnie Was There are female, and it comes as no surprise to see that Geena Davis’ voice work appears in the English language version, considering she launched her Institute on Gender in Media back in 2007. Whilst The Force Awakens may have given us a female lead character, films like this actually show us what it’s like if female characters aren’t the minority. The film skilfully portrays the angst and fears that go hand in hand with our early teenage years, and the bond formed between Anna and Marnie is a fantastic depiction of the kind of intense platonic relationships that teenagers have. Anna’s character isn’t perfect – in fact she at times comes close to being a bit of a brat – but I still sympathised with her. The animation is stunning to behold, and it really shines on the Blu-ray. There are a hefty dose of special features, including a picture-in-picture presentation of the film’s entire storyboards. There’s a featurette with the American voice cast, as well as a 40-something minute behind-the-scenes doco that looks to have been made for Japanese TV. Curiously, there is also a presentation of the art of the film, which consists of someone walking around a When Marnie Was There exhibition with a handycam. 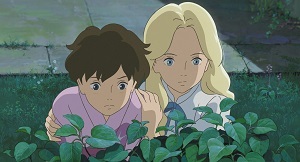 If The Wind Rises disappointed with its sidelining of female characters (quite out of character for Ghibli), When Marnie Was There makes for a great panacea. I’d be lying if I said the resolution was as entrancing as the journey, but I loved this mix of pseudo-ghost story meets ‘Swallows and Amazons’. When Marnie Was There is available now on Blu-ray and DVD from Madman. This entry was posted in Film Reviews and tagged Anime, Drama, Fantasy by Stuart Wilson. Bookmark the permalink.